We put together a list of Rube Goldberg books. If you want to learn more about Rube Goldberg his life, and his way of doing things, you need to check these out. A Rube Goldberg Machine is best described as a machine that does something in a very complex way to complete a very simple task. Now you may be asking yourself, “Why would anyone want to make something so much harder than it has to be?” Well, because it is a ton of fun and very amusing as well. We love a good Rube Goldberg machine and I wanted to share these books with you because they offere a peak into his world. We enjoyed looking at Rube Goldberg’s cartoons and sketches, and enjoyed his humorous take on things. Use these books to get ideas for building your own Rube Goldberg machines and to learn more about Rube Goldberg. One great reason to get these books is that as a bonus, your kids are going to learn a ton by messing around with Rube Goldberg machines. If you are not very familiar with Rube Goldberg contraptions, pop over and check out our Rube Goldberg post for more information. The first book I am sharing is a children’s book about Rube Goldberg. Just Like Rube Goldberg: The Incredible True Story of the Man Behind the Machines is the latest book published about him. It gives the story of his life in a quick and easy read. Also includes four of his comics at the end of the book. It is a fun read and gives a good overview for kids. Rube Goldberg: Inventions! showcases Rube’s own cartoons, sketches, comic strips and inventions. This is a very good overall collection. This book is the “official” Rube Goldberg Guide put out by his granddaughter. The Art of Rube Goldberg has both color and black and white images, starts at the beginning of his career and goes through to the end. This is a very thorough book of his life work and is a gem for those who really want to delve into Rube Goldberg. This one is my personal favorite.The Best of Rube Goldberg has all the very best contraptions in it and we found this to be the most helpful in getting ideas for building our Rube Goldberg Machines. Rube Goldberg: His Life and Work has 190 cartoons in it. I did see this years ago but it is only available used right now. You could check to see if your library has a copy. Written by the man, himself, Rube Goldberg: A Retrospective is a 95 page collection of what he felt were his best drawings and Rube Goldberg Vs. the Machine Age; A Retrospective Exhibition of His Work With Memoirs and Annotations gives you a look into the satire and opinions, as well as the cartoons of, Mr. Goldberg. 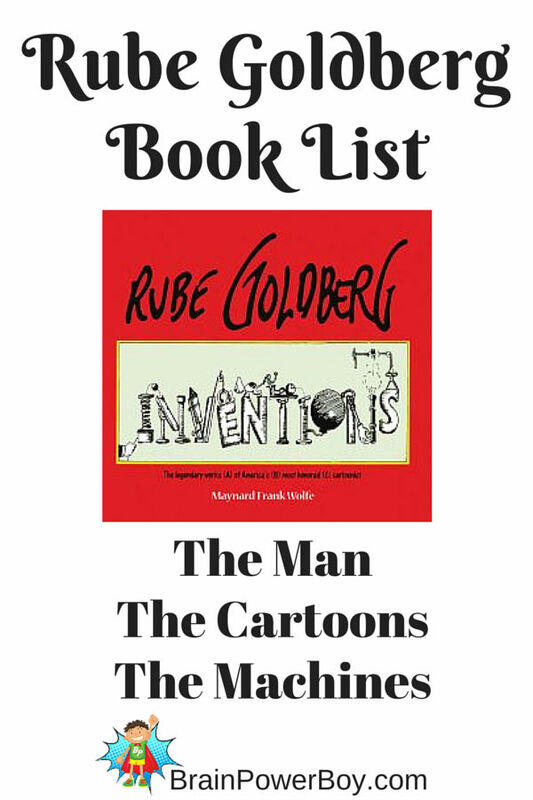 Having drawn nearly 50,000 cartoons in his lifetime we have a lot of Rube Goldberg ideas to choose from in these books! What I love about these books is that they are a look back in time (you may find a few things that are going to make for good discussions!) and they give a plethora of information about this famous man. They also have a so many of his cartoons in them and they are just so amusing to look at. These books really show what a Rube Goldberg machine is all about so anyone interested can try to make their own. See: Play and Learn with Rube Goldberg Machines or Rube Goldberg Materials and Tasks to get started making contraptions. Thanks for stopping by 🙂 I’m sure there are a lot of kids who will enjoy these books. My son sure did.